Stairway to Heaven follows the yellow line up the top edges of the fins of rock. On Sunday, after running the Federal Cup 5K, and previously climbing Swanson’s Arete, I co-led a rock climbing graduation climb for 2 of my CMC Boulder’s Basic Rock Climbing students, Jack and Shawn. Mike, the senior instructor and trip leader, picked the perfect grad climb: Stairway to Heaven (5.3). It is a fun climb with a few mild but interesting challenges. I was excited to climb something new and in a more remote location. 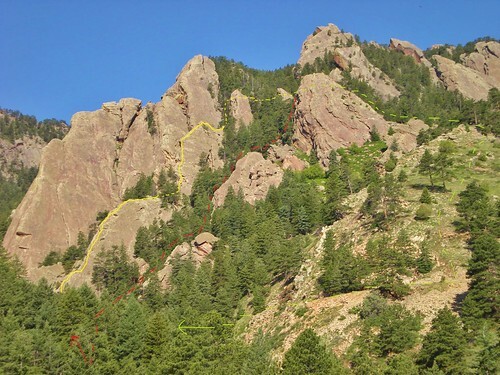 On a pretty day like today, there was bound to be scads of climbers on Flatirons 1-5! Also, I was super happy Andy climbed with us. 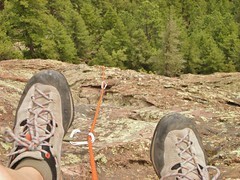 He assisted with belay transfers, which greatly improved our ascent efficiency. He also helped me to communicate with Mike, who was way out in lead. Thanks, Andy! 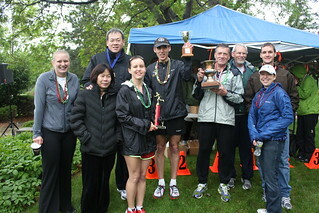 The day after climbing Swanson’s Arete, I competed in the 2012 Federal Cup 5K Race. It’s an annual event, with participation from various federal agencies in Denver. TRICARE TRI-UMPHANTS are the reigning champs, so I was excited to be part of the team in defense of our title. I was pretty worn out from climbing the stairs up the side of the Redgarden formation, so I wasn’t expecting to win (like I did last year!). I ended up getting 7th place out of 105 women and 2nd place out of the 33 women in my age category, with a time of 22:55 (7:23 min/mile pace). Not too shabby, but definitely short of my goal (under 22 minutes). The crux of the race was the incessant rain. My poneytail was totally soaked and it kept thwapping me in the face, which wasn’t all that pleasant! However, I felt very comfortable running in the cold. It was a nice contrast to the heat from the year prior. All in all a superb event and I’m glad I ran. 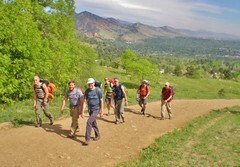 On Friday, I led a CMC (Colorado Mountain Club) climb up Swanson’s Arete on the Redgarden formation. Jeffrey and I had now each led the first pitch up the West Chimney. We had it dialed and we were eager beavers for the summit. 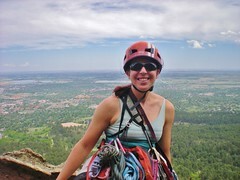 I am an assistant instructor for the Colorado Mountain Club’s Basic Rock Climbing School. Our first outside field trip was to the Flatironette in Boulder, CO. It’s a tiny flatiron rock formation which is situated just in front of the first flatiron. It is a perfect place to take people who are new to climbing. It has very mellow 2 pitch climbs, with no rappel. The only serious issue is the exposure of being up high. Thankfully, none of our students had a debilitating fear of heights! On Friday, Dennis and I celebrated our 9th Anniversay (albeit 6 months late!) by flying in a Hot Air Balloon. When I was thinking of something romantic to do for our special day, a colleague of mine (who is a Balloon Chaser) recommended we fly with Fair Winds Hot Air Balloon Flights. We arrived at the field, in the north part of Boulder, at 5:45am. We were treated to a delicious smorgas board of treats, coffee, juice, and milk. Then, the crew started inflating the balloon. It was super cool watching everybody working together to get it inflated. We had a pre-flight introduction and brief, where Jeff (pilot & owner) explained to us the protocol of flight. We were all very excited. The flight went insanely smooth. It is seriously the most calming experience! The Front Range was a swath of snow covered peaks, laid out in front of us. The town of Boulder and the CU campus were equally as neat, from our perch a couple thousand feet up. After the flight, we got tee-shirts, champagne, a commemorative photo, and a goodie basket. I would highly recommend flying with Fair Winds, they are a locally run and operated company who have top notch customer care. Even though we were in the basket with 6 other people, we felt like it was a private tour. A big thanks to Jim for suggesting we try riding in a Hot Air Balloon. It was an unforgettable experience! You are currently browsing the climbergirl blog blog archives for May, 2012.